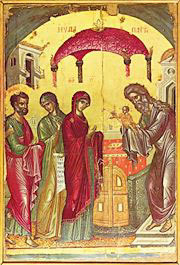 On this Day of Grace, forty days after the Nativity of Our Lord Jesus Christ, the Church celebrates the Feast of the Meeting of Lord, namely, of his presentation in the Temple (cf. St Luke 2:22-40). The rich service of this Feast affords us yet another opportunity to contemplate (albeit very briefly) how Liturgy reads the Bible—that is, how the Church’s liturgical texts interpret the Scriptures after the model of Apostolic and patristic exegesis. In his Gospel narrative, St Luke writes (2:22-23) that Christ was brought to the Temple to be presented to the Lord according to what was written in the Law of Moses. Commenting on this, Liturgy calls the worshipping faithful to not simply regard St Luke’s indirect quotation of the Torah as a mere citation—a footnote, as it were—but to further discern in it a “figure,” a type (τύπον κατίδωμεν, typon katidōmen). It wasn’t only that Christ was presented in the Temple to fulfill the command of the Law, but rather that his presentation itself was The Fulfillment of the Law: he alone was the Holy One of God to which pointed every firstborn male that was presented to the Lord and called holy. This entry was posted in Liturgical Exegesis and tagged Liturgical Exegesis. Bookmark the permalink. I’m not sure why, but this is my favorite story in the Bible. I wasn’t aware of this day being celebrated. Thanks for writing about it and for the links. BTW, I too find these musings useful. But isn’t a “simple messianic reading” and a “redemptive-historical understanding” really just two sides of the same coin? Wow, I hadn’t realised you’d been posting on this. I intend to get back to the previous two posts. I’ve also been posting on the question of the relationship between dogmatics and exegesis, though as an evangelical I don’t have the full equipment people such as yourself are in possession of. I hope to hear more. It’s still an open question for me, however, as to whether the exegesis of the apostles should be normative for our exegesis … But then that’s just the Childs in me. What I’ve called a “simple Messianic reading” is one not grounded in the historical meaning of the text, but which treats it as a mere prediction or else allegorically. (Think, example, of the Rahab’s scarlet thread and its association to the blood of Christ.) I would suggest that such an approach is fundamentally different from a redemptive-historical reading of a Messianic text, not a different side of the same coin. Both depend, however, on recognizing that one text or another should be read Mesianically, but go about that task in quite different ways. Childs in you is right, of course: the normativity of Apostolic exegesis is open to question, and some of its opponents are quite formidable (cfr. Longenecker, Biblical Exegesis in the Apostolic Period). But I myself see an unbroken thread that leads from intracanonical exegesis (especially of the OT by the NT) to patristic exegesis to the grand synthesis of liturgical exegesis, and this to me is a powerful argument regarding what the Church qua community regards as normative for herself. I guess it’s important to me that this “intracanonical” movement goes in both directions, not just from the NT to the OT but from the OT to the NT. Patristic exegesis was a mode of working out the relationship, but surely if we following the logic of their exegesis and not just the method then we need to allow the OT to speak for itself on its own terms and thus “colour” our understanding of the New. Those are tentative thoughts, at least, inspired by Childs and Seitz.